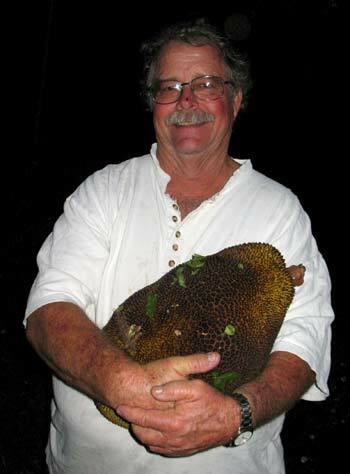 Robert just loves some jakfruit. Last week was the start of a new CSA season, and to kick things off, The Cantankerous Chef AKA Robert Barnum invited Farmer Margie and her crew of interns, apprentices and volunteers to come over for dinner at his Possum Trot Tropical Fruit Nursery. Every CSA season, Margie has a different group of people picking and packing all the goodies you get in your share box. This year’s helpers are Jane, Liberty, Helene, Tomas, Eric and Lauren. They have come from as near as Florida and as far as Michigan and Europe to work at Bee Heaven for the season. The group arrived at Possum Trot just as the sun was starting to set. Robert offered an abbreviated tour of his 40-acre grove before dinner. We strolled down a grassy path and paused from time to time as he pointed out various trees. (This is by no means a complete list of what grows at Possum Trot.) He has: osceola tangerine, macadamia (squirrels pillage the nuts), grumichama (which has a cherry-like fruit), jaboticaba, pithacyillobium (its sawdust will stain your skin blue, really! ), a giant brassus palm killed by last winter’s freeze and still standing, mamoncillo, Central American walnut, several jakfruit loaded with fruit, sugar palm, oil palm, and Orinoco banana. Over in the lychee section, golden orb weaver spiders had spun their webs overhead, and appeared to float against the darkening sky. As we walked and listened to Robert’s spiel about his trees, the twilight grew deeper and an almost-full moon rose over the tree tops. It was getting too dark to see, so we headed back to the farm house where we were greeted by the mouthwatering aroma of bread baking. The Crunchy Bunch: Liberty, Helene, Robert, David, Eric, Lauren, Jane, Tomas. Not seen: Margie, Marian. Mamey-pineapple-banana ice cream, with a dab of cas guava ice cream at the bottom. I didn’t realize how hungry I was until I started eating, and forgot to photograph my plate before it was devoured. I guess that means it was good! 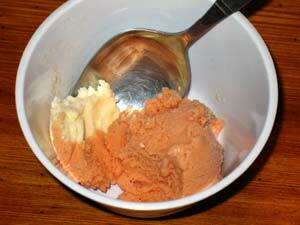 Robert scooped up homemade mamey-pineapple-banana ice cream, which was outrageously smooth and creamy. Banana mellowed mamey, but pineapple was a bit shy. After dinner, we broke out the wine. Robert’s friend David Weingast, who had joined us for dinner, brought a California organic petite sirah. (David’s Organic Company ships Robert’s fruit.) Robert produced two bottles of his home brewed bignay wine. One tasted much like a merlot, and the other was a sweet dessert wine made with champagne yeast. The Crunchy Bunch sipped and sampled and picked their favorites. The dessert bignay got a lot of votes. 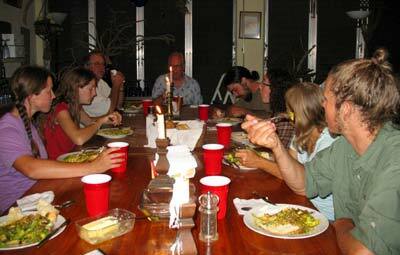 It was a pleasant end to a delicious meal, and the Bunch enjoyed their last easy night before the frenzy of the CSA season began. For lunch or dinner reservations, trees, fruit and/or a tour of Possum Trot, contact Robert Barnum at 305-235-1768 or possumplentious@yahoo.com.